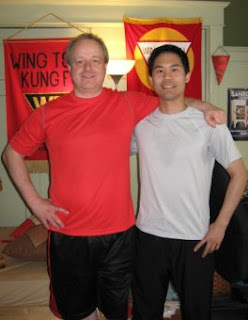 How many years have you trained in Wing Tsun, or your martial art of choice, or whatever other endeavour? My profile states "A student of WT since November 2004". Very true. Forever a student of course, at least that's what I believe. But what about that second part - what does "since November 2004" mean? Why, nearly 5 years of training by calculation. Ah... but how much do you train, an obvious question. For me, it has been at most only 2-3 times per week, minus vacations, intermittent chunks of absences when busy with family/work, etc. I started taking private lessons more regularly only after 3 years or so. So maybe that 5 years all boils down to only 6 months of training 40 hours/week. Not much, eh? Recently, I had the wonderful chance of being part of a 10-hour Chi Sau Marathon (http://www.realisticselfdefense.net/blog/index.blog?from=2009051313). Not 10 hours for me, just the one for the students! Granted I was recovering from an earlier private lesson 2 days prior, resulting in a lot of new interesting sores and pains, all good of course! But this doesn't compare to the 10-hour training session of Sifu Ralph Haenel. How does one get better? Time. Quality of training. Effort spent. You would think that these are obvious points, but how many of us train enough in these ways? Spending lots of time with proper training, and sweating profusely! Is this a reachable state in people's busy lives with a full-time job or a couple of part-time jobs, a family and other responsibilities? Perhaps not for a long time, but it also depends on what you are able to take away from lessons and group classes. Munch up every bit of information. Just like anything, you can choose to mindlessly wander through without really understanding and developing ideas, or you can try to analyze and incoorporate concepts to improve your limited time spent training. All theory and abstract banter? I'll leave it up to you to decide! That's a good question, Evan. It reminds me of the year 1990. I was still working full-time in another job, even in shifts, I visited two group classes a week at my instructor's school, gave two evenings group classes in my Wing Tsun school, took some private lessons from my WT instructor, gave some lessons to my students, and on holidays or days off I often drove 800 km's one way to the famous Wing Tsun castle for classes or seminars. That's of course crazy and I would never recommend it to someone else. In the end it all boils down to the following, which I merged out of several sayings of my instructors: "It's not the number of years one has trained, in the end it's not even the number of hours of training one has put into those years, but how intense one has trained each hour." One example. A while ago someone asked me the following question: "I train 1,000 chain punches several days a week, but my punches don't seem to get any stronger?? What should I do?" Now I replied: "At the end of each series of 1,000 chain punches, are you on your knees on the floor, sweat dripping from your forehead, your arms and shoulders trembling?" Answer: "No, of course not." Realization a few moments later: "Oh!" So, how intense do we all train in the time that's available to us?